Last week I attended Craft Central in London. I have been to one of their workshops before and so was really looking forward to it. 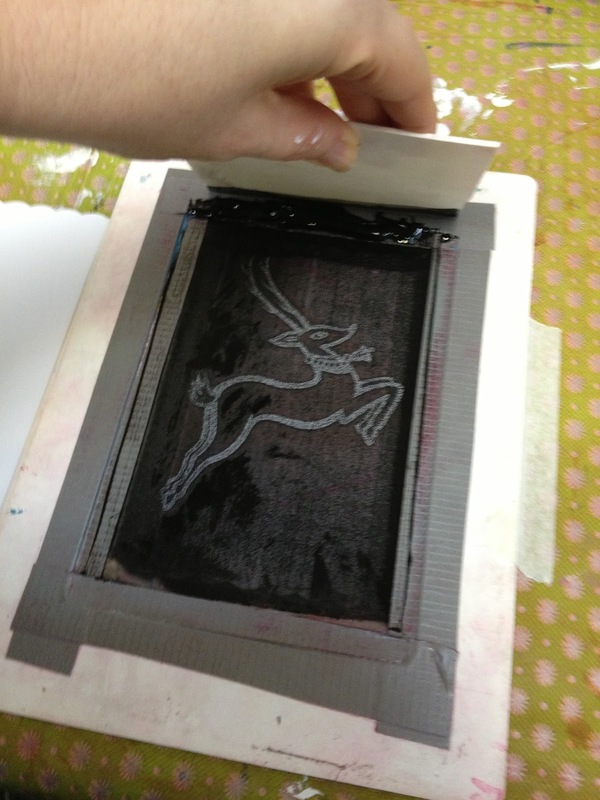 About a week after I booked the hugely popular (it has sold out in hours previously)‘Craft It Yourself: Printing using Japanese PrintGocco machines’, they emailed me to tell me that the workshop was going to be slightly different than advertised. 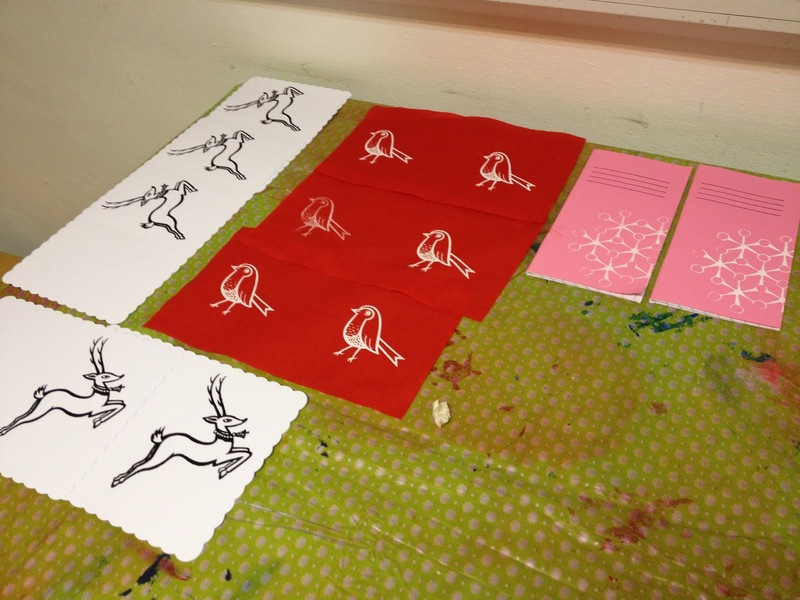 It was to be - making your own Gocco print so that you can print your own items in the workshop (if you have time) and take it away with you. 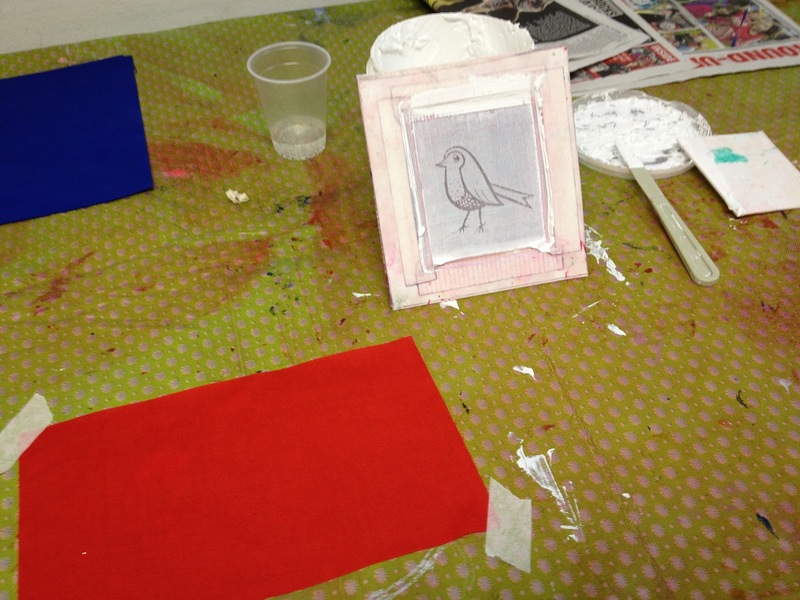 What it actually was - was to use the screens that the workshop leader had prepared to print our own Christmas cards and fabric to make decorations (mainly bunting I think). But either way I had some good fun and made some lovely bits, I would have really liked to have done my own, but maybe next time CraftCentral. So we started out by meeting our workshop leader Xtina Lamb who is from Printed Wonders and she showed us the screens and the items that we could print on. 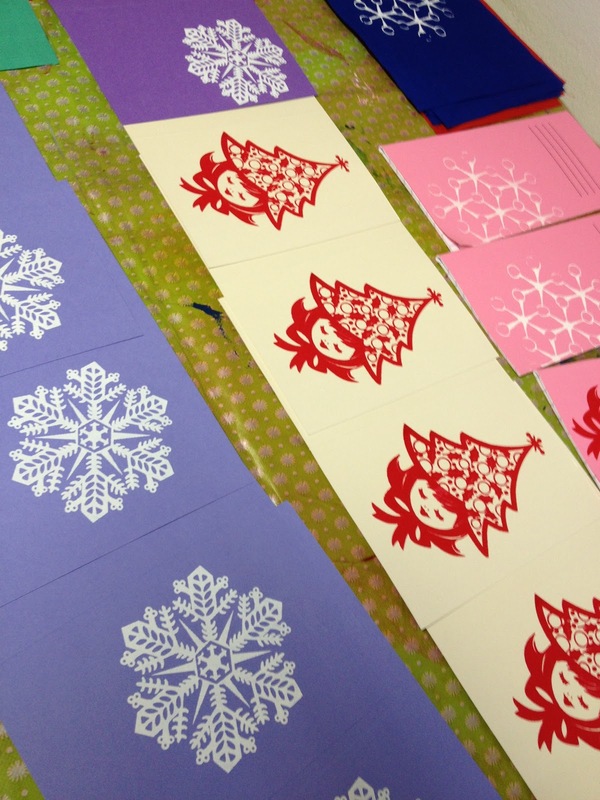 We had cards, fabric and notebooks to print on using the screens and designs that Xtina has done already. These smaller screens make really quick and easy ways to print cards or smaller items. The screens are made using a Japanese Gocco machine, which I believe have stopped being made now and are really difficult to find, EBay and scouring all auction sites are probably your best bet! They were built in the 80’s for children in Japan to use them for card making as they are so simple to use. Apparently you put an image, either a photocopy or drawing and some screen printing mesh into the machine and a big light flashes to imprint the image onto the mesh, you can then make the screen by attaching it to a card frame. It is a shame they have stopped making them, but I guess traditional screen-printing and stamping has taken over and so maybe they just were not selling enough. So we each chose a screen to start with and used the screen-printing paints and a piece of plastic as a squeegee, we proceeded to place our item – lets say card down on the table (over a cloth of course), place the screen over the top and place the paint at the top of the screen and then dragged it over the screen – just the same as you would in screen-printing, but without the pressure – there is no need to be heavy handed with it. You can then pick up the screen and voilá your item has been printed! It is so very simple, although these were made for children to use, so you really would hope so! I started getting a bit of a production line going with using different screens and items to print on, I went for printing straight onto cards, printing onto fabric so that I can turn them into decorations or cut them out to put on cards and I also did a few notebooks! This was actually a really productive evening (it was a 2 hour session) and I got so many done that I think all my Christmas cards are done for this year and I may even have enough for next year! Bonus. I had a lot of fun and got to chat to some new people and that’s part of the fun in doing these workshops isn’t it? Plus I got to hang out in London for the evening, which was very nice as it’s not just around the corner anymore. So all in all, although I would have liked to have done my own screen I still had fun and Xtina talked about the machine a lot and the screens and so I think I will definitely be looking for one. Plus Xtina mentioned a company called Thermofax which I believe makes up screens for you, either there own designs or you can design your own, so that may well be another option. I have always loved printing and so I think this will be another string to my bow for printing up the presents in 2013!